Spain has two enclaves in Morocco, Ceuta and Melilla, and migrants from all over Africa regularly try to reach them, mostly by climbing the border fence that separate them from Morocco. The border fence consists of 6.8 miles of parallel 10 feet high fences with razor-wire, regular watch posts, CCTV, spotlights, noise and movement sensors, and a road running between them for police patrols. Deaths and injuries are common and have increased since razor wire was installed. On February 6 fifteen immigrants died off the coast while trying to swim around the seawall to reach the Spanish enclave. Spanish Civil Guard, who was alerted by Moroccan security forces that the migrants were approaching, didn’t admit any responsibility in the tragedy. Migrants who survived accused the Civil Guard of firing their weapons at them while they were in the water, rubber bullets included, which caused the panic that resulted in the tragedy. Head of Civil Guard and Spanish Government denied it and lied about the circumstances surrounding the tragedy. 1. NGOs released videos, pictures and interviews with surviving migrants showing that panic set in as Civil Guards began firing tear gas and rubber bullets at those attempting to swim. [Examinations by the Northern Observatory for Human Rights on some of those who died confirm that some had marks indicating they had been shot by rubber bullets. The observatory also stated that the Civil Guards did not assist the migrants or alert the rescue coastguards]. 2. European Commissioner for Home Affairs Cecilia Malmström immediately said on twitter that European Commissions wanted an explanation about why police fired rubber bullets in warning. EU has asked Spain for an independent investigation. 3. 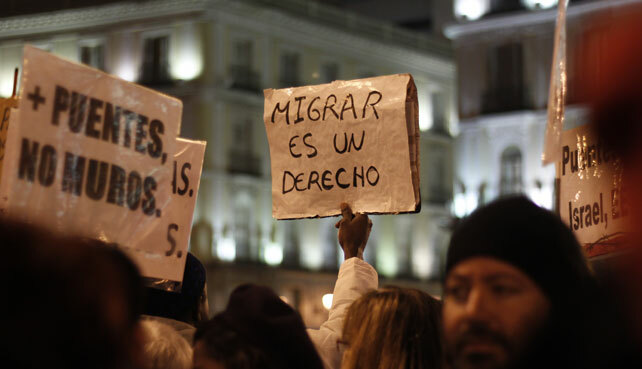 People organized themselves online and protests took place in 15 Spanish cities to condemn the death of the migrants. Placards proclaimed, “They didn’t drown, they were murdered,” “Natives or foreigners, we’re all the same”, “No one is illegal,” and “Where are the pro-lifers now?” (In reference to those who support the new restrictive Abortion Law being prepared by the Spanish government run by the Conservative Party). 4. Interior Minister Jorge Fernández Díaz was forced to appear at the Parliament. He acknowledged that Civil Guard officers fired their anti-riot weapons, contradicting an earlier version. 5. Almost 200.000 people have signed a petition demanding the minister resignation because of the tragedy and manipulation carried out by state forces to cover his speech.